You may have heard of a little startup in Singapore named nuTonomy. We’ve previously shared that the company has initiated trials of its driverless taxi service in One-North back in April. Many shrugged it off saying that it would not take off and be used by Singaporeans – much like electric cars. nuTonomy is out to prove naysayers wrong with exciting news to share – you will be seeing self-driving taxis sooner than you think. Hot on the heels of raising its latest round of USD$16 million in funding, nuTonomy is setting its sights on its target in bringing their proof of concept onto our roads. 2018 is the magic number, and they plan to launch a commercial offering in that year, poising to become the first in the world to do so. The R&D fleet of autonomous vehicles that they have been testing in One-North has made it possible for them to become the first private company to win approval from government bodies to test their cars on public roads. This funding has accelerated the pace of which they are keeping progress in the deployment of self-driving vehicles in Singapore and beyond. While the big boys like Google, Uber and Tesla have been fighting it out in the United States where it is much harder to establish infrastructure (as nuTonomy has found out), this relatively tiny startup has been quietly making remarkable progress on an equally tiny country. In Singapore though, the startup may well be the first of many potential suitors for the self-driving pie, with Uber and BMW among the invited companies who have not started testing here yet. They are even planning to supplement their R&D fleet of Mitsubishi iMiev cars with the addition of Renault Zoe Electric Vehicles. Permanent Secretary of Ministry of Transport Pang Kin Keong told Wall Street Journal that the government is inviting companies as well as research institutions to test-bed their technology and concepts here, using real-life, mixed-use traffic conditions. In addition, through the contribution of financial resources by the government in these partnerships, Singapore is able to fast-track regulatory and other administrative approvals and get the trials and test-beds up and running quickly, and with as little fuss as possible. Singapore isn’t just stopping at public transportation. You may have heard of a company called Otto, founded by ex-Google employees who are trying to integrate self-driving technologies into trucks. Mr Pang also shared with The Straits Times earlier in April that there are also plans for the truck platooning technology trails to find ways in dealing with the shortage of drivers in the logistics industry, as well as deploy self-driving utility vehicles for rubbish collection and road sweeping. Going by the promotional video that nuTonomy released just a few days ago, there’s definitely something exciting to look forward to. While robotics can take care of itself, the other cars on the road with human drivers are still the worrying part. As we’ve learnt from Google, accidents still happen no matter how safe the self-driving vehicles are programmed to be. nuTonomy themselves too have some kinks to work out in preparation of the 2018 launch date. Someone over at Recode recently gave an account of his experience with the startup’s taxi service at One-North. 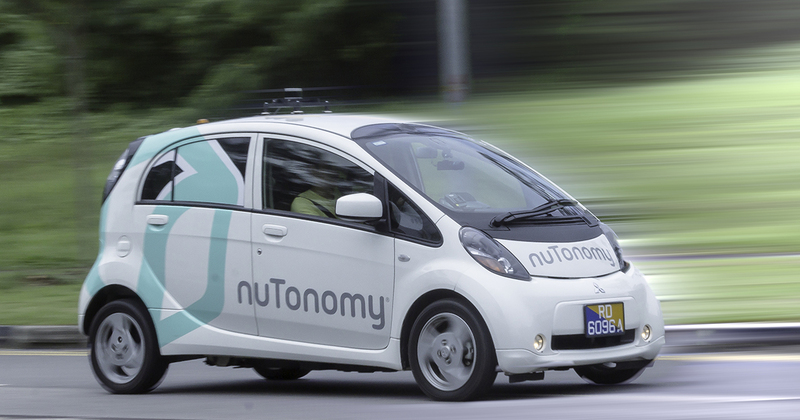 Aside from the abrupt stops and some clumsy manoeuvring, nuTonomy did a fairly good job navigating a more complex environment as compared where other self-driving car companies normally test at. In fact, these carmakers have yet to even begin testing their vehicles around pedestrians.